Updates ongoing as research is completed. Help to Keep This Website Operational! A/C was a marked JMC and was returning from one of the first missions flown following the offical Cease-Fire to Can Tho when a single VC fired at the A/C hitting the pilot. Pilot died one day later from injuries. A/C was tasked with flying 2 men from the MACV Regional HQ in Hue on a support mission to several LZs in the vicinity of Quang Tri City. Direct hit was made on the tailboom by a missile, reportedly an SA-7 (YD324528). *Knutson's remains returned in 1995. Wilson & Dean's remains returned in 1996. Killed during a rocket attack standing near his Huey while Troop was staging at Kontum Airfield. A/C hit with 60 mm RR right at the nose. T/R was knocked off while flaring to avoid chalk 1, A/C crashed in the LZ. CE survived crash but was killed by gunshot from ARVN boarding rescue A/C. A/C was shot down by .51 cal fire, lost torque and crashed on fire, nose down, on the right side, from perhaps 150-200'. 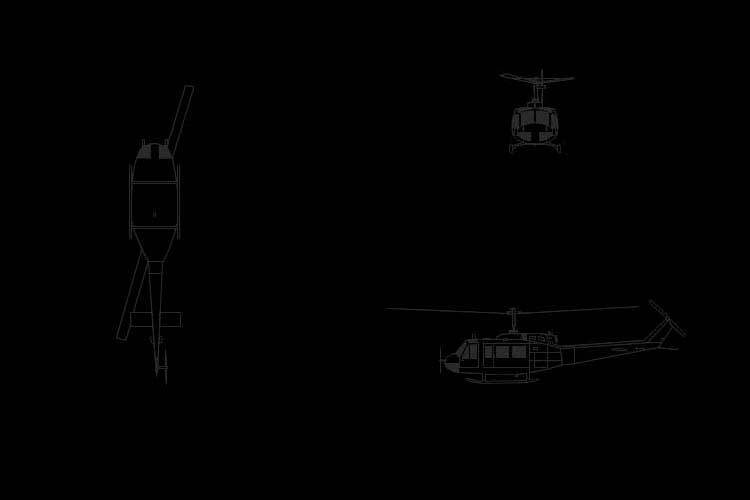 Killed trying to go in to rescue crew from downed UH-1H #67-17446 (above). During approach to LZ, M/R baldes made contact with a tree. 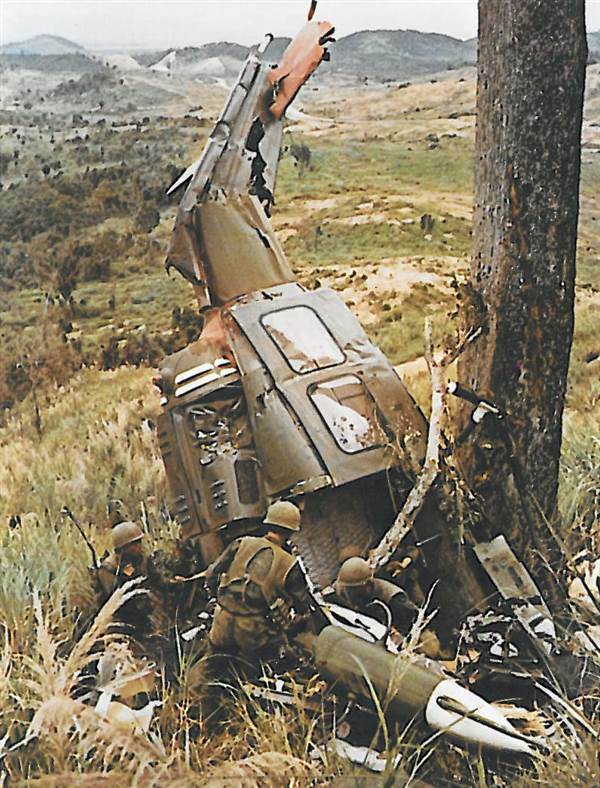 A/C was flying C&C when shot down by SA-7 near Hue. While flying C&C ship, pilot was shot in head while checking to insure targets were NVA. A/C destroyed by SA-7 while assisting elements of F/4 rescue two AF pilots and one AF FAC. T/R hit ground, spun and crashed nose first while resupplying a beseiged Korean fire base at An Khe Pass. Mission to extract Team 22 advisors. A/C was apparently hit by enemy fire, as it crashed and burned on a small island in the Dak Poko River about 500 meters from the end of the dock to the runway. A/C was flying around a mountaintop in a left bank when it entered low level clouds covering the top. A/C then returned to an almost straight flight path with a slight rate of descent, before impacting into the side of a ridge. A/C crashed into trees and burned upon impact. Killed as a result of enemy gunfire during an extraction mission. Killed during a CA in the An Khe Pass approx 1k SSE of Binh Khe village. Killed by small arms fire. *Last dustoff aviator killed in Vietnam. A/C was on a routine resupply mission to signal units in and around Quang Tri Province. A/C was flying from Marble Mountain NW to Quang Tri City when the A/C disappeared. A/C was on a SAR mission and flew at 300' AGL to provide air cover for other helicopters flying at only 50'. Just after flying over some huts near the tree line and over a clearing, A/C encountered heavy and accurate enemy ground fire, causing crash. *Kulland's remains identified in 1994. A/C was on a mission to rescue crew of a downed VNAF helicopter which had crashed at an LZ in Kontum Province. Accompanying gunships made an attack pass to suppress enemy fire in the area, and the A/C descended to make the rescue attempt. As A/C was landing, it received heavy AW fire, crashed and rolled down a hill, coming to rest upside down. A/C exploded in flight and fell into a river east of Bien Hoa. A/C lost power shortly after take-off from Cam Ranh Airfield. The A/C struck the ground in a nose-high attitude, bounced, struck again in a slightly nose-low attitude, spun around, and burst into flames. A/C was lifting off from the destroyer USS Craig helipad, the A/C executed a right pedal turn causing the T/R to impact the guard rail on the next higher deck. Impact caused the T/R to separate from the A/C and strike the M/R, which in turn severed the tailboom. The A/C crashed in the water inverted and sank in Da Nang Harbor. A/C went IFR over water and impacted after 180 turn was attempted. A/C was on a routine resupply mission for ROK, proceeded to LZ1 where supplies and PAXs were to be dropped off. On final approach A/C spun right and downward until impacting trees on the NNW side of pinnacle, coming to rest approx 110' below pinnacle. On impact the gunner was thrown and died of injuries. A/C was on a recovery mission for downed F4 fighter jet pilots. Crew was returning from the mission NW of Kne Sanh when AAA fired and hit the A/C, causing it to catch fire. The fire immediately spread over the boom and then engulfed the entire A/C. A/C autorotated to the bank of the Raoquan River, landed hard and rolled over onto its left side and exploded. Moran and Figueroa died in Japan several days later of injuries. Gunship was covering a Chinook resupplying an ARVN base near Ca Mau when the A/C suddenly exploded in mid-air, possibly hit by an RPG or large caliber weapon. A/C was providing fire support for a helicopter crew who's acft had been destroyed in a LZ by a B40 when CE was mortally wounded. This website is not a product of the Department of Defense, the Department of the Army, or any other government agency. Most unit patch images have come from the VHPA Museum website.